Trump Praised for Speech, But Can He Continue Unifying Message? President Donald Trump won cheers by calling for unity in his speech to Congress Tuesday night. Trump appealed to Americans to unite and work together on job creation, national security and other issues. Some wished he gave the speech at the start of his presidency, just over 40 days ago. That was the opinion of The Mercury News in San Jose, California. “Had he (Trump) offered this speech a month ago, at least some of the panic that has accompanied his election might have been calmed,” the newspaper said in an editorial. The Mercury News said it cannot forget that Trump in his speech asked for an end to “trivial fights” after fighting since the start of his presidency. His targets have included the news media, the U.S. National Park Service and even movie stars like Meryl Streep. But the newspaper praised Trump for not talking so much about himself during the speech. Instead, it was “we, we, we -- as it should be in a democracy,” the editorial said. Even some of Trump’s critics offered praise. Van Jones is a liberal commentator for CNN television. Jones said he disagrees with most of what Trump proposed Tuesday night. But he said it was a special moment when the president recognized the wife of a U.S. Navy seal killed in Yemen. She fought back tears as lawmakers and others in the Capitol building stood and cheered for over two minutes in tribute to her husband’s bravery. “He (Trump) became president of the United States in that moment, period,” Jones said. Carryn Owens, widow of Navy Seal William “Ryan” Owens, is applauded during President Trum's speech on February 28. Members of Trump’s Republican Party joined in the praise. Yet there were questions about whether Trump can put into action the long list of proposals he noted during his hour-long speech. “Like most presidents he was strong on the goodies, but a little weak on how to pay for it,” said Texas Congressman Joe Barton, a Republican. 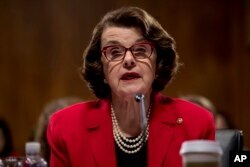 California Senator Dianne Feinstein added: “It sounds great to slash taxes and spend more money while at the same time balancing the budget, but that’s not how real life works.” Feinstein is a leading member of the Democratic Party. But an opinion survey for CNN found that about seven in 10 Americans who watched the speech said they are now more hopeful about the future of the country. Will he return to Twitter? There were questions about whether Trump after making a generally well-received speech about unity might soon return to Twitter to attack his critics. Russia said it did not take issue with Trump’s decision not to talk about Russia Tuesday night. It is natural for him to “be busy with American affairs while our president (Vladimir) Putin is busy with Russian affairs,’” a statement said. Chinese officials disputed Trump’s criticism in his speech of one-sided trade deals. He said that such deals led to factory closings in the United States, with businesses moving their operations to China. A representative of the Chinese Ministry of Foreign Affairs said China-U.S. trade benefits both countries. Bruce Alpert wrote this story for VOA Learning English. It was based partly on reports from VOA’s Chris Hannas, Katherine Gypson Kane Farabaugh, Michael O'Sullivan and Carolyn Presutti. George Grow was the editor. We want to hear from you. Write to us in the Comments Section and share your views on our Facebook Page. Did you watch the speech or read about it? And what did you think -- good or bad?